In Finland, Christmas is Joulu, which is related to our word, “yule,” and Santa Claus is Joulupukki. It is said that he lives in Rovaniemi. This post is being composed on a laptop computer in the Hotelli Cumulus Rovaniemi, just a few kilometers south of the Arctic Circle (Napapiiri). I have just had dinner here in the hotel, at the “Polar” restaurant, which has lots of reindeer on the menu. The Finns have staked out a claim to be the world’s official “North Pole,” and they have pretty much made it stick. Here’s a link: http://www.rovaniemi.fi/?deptid=3694. Let the record show that I came to Rovaniemi for two reasons. First, I wanted to see Arktikum, a museum of Arctic natural history and culture, which is said to be one of the better museums in Finland. Second, I wanted to find out more about Alvar Aalto’s contribution to the rebuilding of Rovaniemi after the Second World War. I’ll cover that subject in a separate post. Okay, I’ll admit it. I thought that if I came away from Rovaniemi owning a picture of myself with Donder or Blitzen, well, that would be pretty neat, too. Rovaniemi is only about two hours north of Oulu, where all the snow has melted, so I was disappointed, but not particularly surprised, to step off the train and onto bare pavement. Then I discovered that I’d have to share a snowless, lightless “North Pole” adventure with several thousand Japanese tourists. I think most of them are high-school kids, and the ones who have acquired the traditional Sámi hats with the pointy little tops are cute as all get out. I hope they didn’t have their hearts set on a snowmobile safari. The locals complain about the lack of snow because it is very, very bad for business. In addition, there is the concern, usually unstated, that the weird weather might be a harbinger of global warming. The rivers and lakes here aren’t even frozen. If nothing else, a nice blanket of snow would have helped to brighten things up a bit. I am composing this particular paragraph at 10:45 a.m., while waiting for the sun to come up before trudging over to Arktikum. I would settle for its lurking just off-stage, if you know what I mean. Okay, I’m back. I decided to shove off in the dark this morning. I’m glad I did, because Arktikum is well worth a visit. It’s on the water, not too far from the city center, and it’s a very sophisticated, haitekki facility. I saw a ten-minute film, called Under the Northern Lights, that features the most gorgeous nature photography this side of the National Geographic Society. The building itself, which is the work of Danish architects Birch-Bonderup & Thorup-Waade, is spectacular. Most of the exhibition space lies under a long, glass atrium that looks like a streamlined diesel locomotive, pointing due north. That’s because Arktikum is all about the natural history of the circumpolar region, and also about the Sámi and other peoples of the far north. Many of the exhibits lie underground, and that makes a certain amount of sense, as well. There is a library for those wanting to do serious research. The exhibits at Arktikum have been prepared by two different institutions, The Arctic Centre, which is part of the University of Lapland, and The Provincial Museum of Lapland. And that raises the issue of government subsidies. Rovaniemi is not a large city. There are only 35,000 people here, and it is the capital of a region with a depressed economy. Without a program of systematically re-directly resources to this part of the world, Lapland would be in big trouble. My point is that cultural institutions such as the University of Lapland and Arktikum are part of a much larger strategy. I have heard people here lament what is happening in Sweden, where it is said that the population is declining everywhere but in Stockholm. I don’t know if that’s true; I’m just repeating what I’ve been told. Years ago, the Finns developed an antithesis that involves substantial investment in regional development nodes in the hope that they will be able to hold their own, economically and culturally, against the magnetic power of Helsinki. In Oulu, for example, government subsidies have made the University of Oulu a major regional university, and the university has helped to turn the city and surrounding area into the “Silicon Valley of the North.” It’s the reason Mikhail Gorbachev came to Oulu in 1989, when he was still in charge of saving the U.S.S.R. But the puppy doesn’t always grow into its paws, at least in quite the way that was intended. And you never know when an unexpected turn of events will render your Big Plans superfluous or irrelevant. In Rovaniemi, a funny thing happened on the way to the Arctic museum. Lordi blasted Rovaniemi onto the European map with its historical Eurovsion win on 21 May 2006. For years to come this win will surely spark off questions such as “Where were you when our monsters won the Eurovision?” How has this mania changed Mr. Lordi’s home city of Rovaniemi? Read our Lordi ABC. The Square: The Rovaniemi Sampo Square (the main square in the city center—KK) was renamed Lordi’s Square in the group’s honour and the group pressed their hands into cement for posterity. Cola: Lordi Cola came on the market last September. Mr. Lordi designed the labels for the six-packs. Hard Rock Hallelujah! Lordi won the 51st Eurovision Song Contest with Hard Rock Hallelujah. They received 292 points, the highest in the contest’s history. Kebab: Torikeidas on the edge of the Market Square sells Lordi Kebabs, and it gave the group members VIP passes for a lifetime’s free supply. Honorary citizenship: The City of Rovaniemi awarded the group’s members honorary citizenship. Rockaurant: December 2006 will see the opening of the monster-themed Lordi’s Rockaurant. A family restaurant by day and a rock pub at night, the idea is to go international. Tomi Putaansuu: Mr. Lordi from Rovaniemi has positively brought Lapland to world attention. The group has brought Rovaniemi’s international image to the fore. The group’s history: It all started with a horror movie fan’s homemade masks. 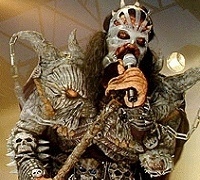 Mr. Lordi has made music since the early 90s. He has always had a clear vision on how he wants the band to look and sound—they make all their own costumes, masks and props themselves. Their breakthrough hit was Would you Love a Monster Man? in 2002. They released albums in 2002 and 2004. With all due respect to my Lonely Planet guide, I don’t think that Rovaniemi is all about “unadulterated commercialism.” I think it’s about the tension between a central planning ethos and the imperatives of global capitalism. A city—especially one on the socio-economic margins, but any city, really—can ill afford to risk everything on one or the other. So they hedge their bets. If public works projects don’t bail Rovaniemi out, then maybe an unholy alliance between Father Christmas and Lordi will. I hope that readers will forgive me for making an irresistible Pittsburgh reference. The city of Andrew Carnegie and Andrew W. Mellon—of iron and steel, of the Urban Renaissance and the Golden Triangle—is now a city that has lost its heavy industry and half its population. Today, its largest employers are its universities and hospitals. So Pittsburgh has harnessed itself to an engine of growth called Andy Warhol. The idea is that the Andy Warhol Museum on the city’s north side, which is being marketed as the world’s largest museum devoted to the work of a single artist, will generate enough tourist revenue for the city to compete in the post-industrial age. Something had to be done. You were expecting Santa Claus, maybe? “Lordi Mania—who, where, when?” Rovaniemi (Winter 2006-2007), p. 27. Joulupukki does not live in Rovaniemi, that's a nonsensical commercial scoop. The Finnish tradition says he lives on, or in, Korvatunturi, which is somewhere on the eastern border in Lapland. Doh! It looks as if I've been duped again by the neon gods of capitalism. Maybe today is the day to drop in on Joulupukki in Korvatunturi, where he must be resting up.